Thought y’all might be able to figure out and appreciate why I’m pretty excited about this gun trade I’m making next week. I also have a CGW massaged Shadow coming in next week. They should both play nicely with the rest of the family. Very nice and you have a Dan Wesson too. 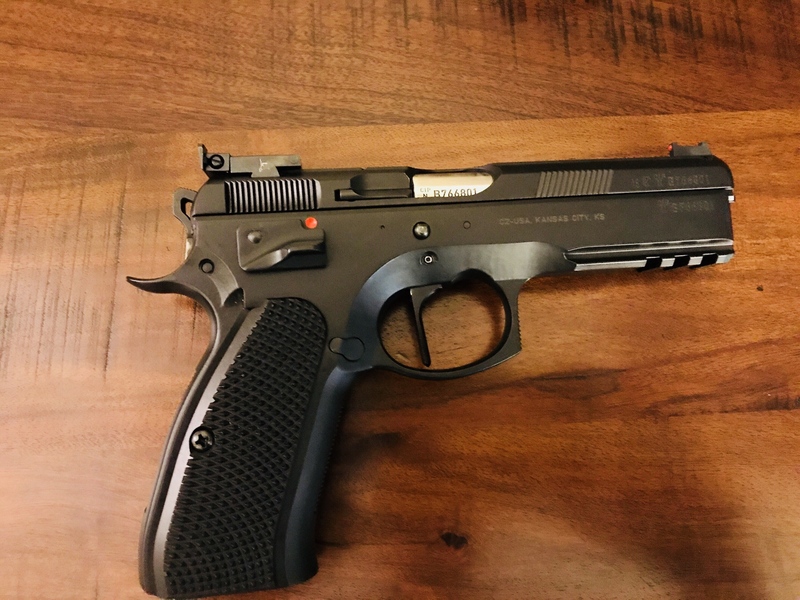 Here is mine, still looking for a CZ 83 though. I do like the DW. It’s a 9mm which makes purists wince but it is an outstanding shooter. Did you catch what’s unusual about the compact in the first picture? I don't see it 74novaman, the suspense is killing me though. I’m not envious often, but when I am. I'm not seeing it either. 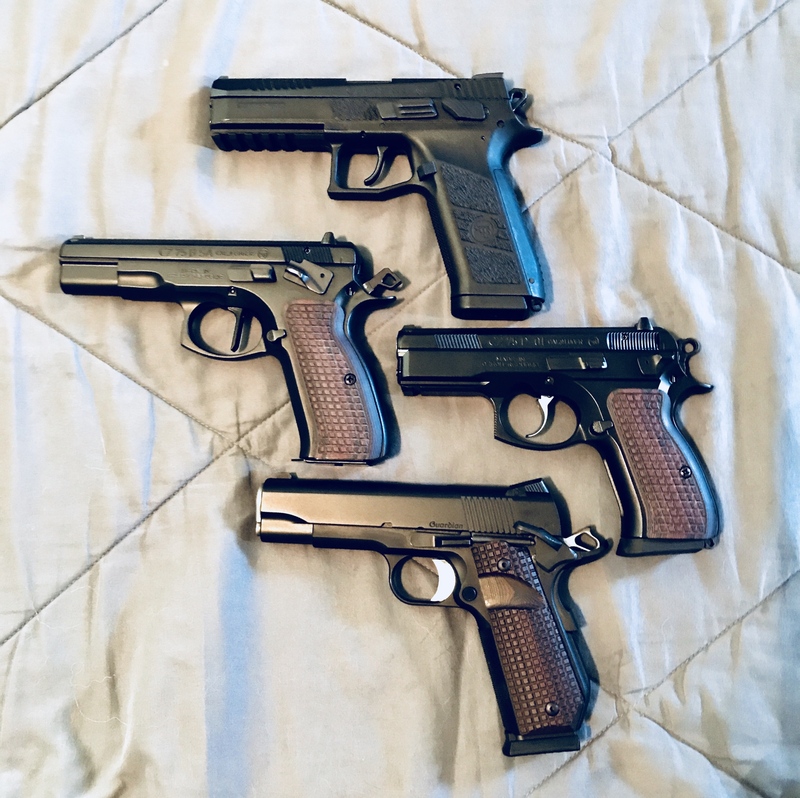 I have 4 CZs - 97BD, 85 Combat, pre-B 75, and 2075 RAMI D. The RAMI is close in size to your Compact 75. Guess I'm not familiar enough with the Compact to notice what's special about it. This is an unusual one. Most compact 75s with a safety have steel frames. 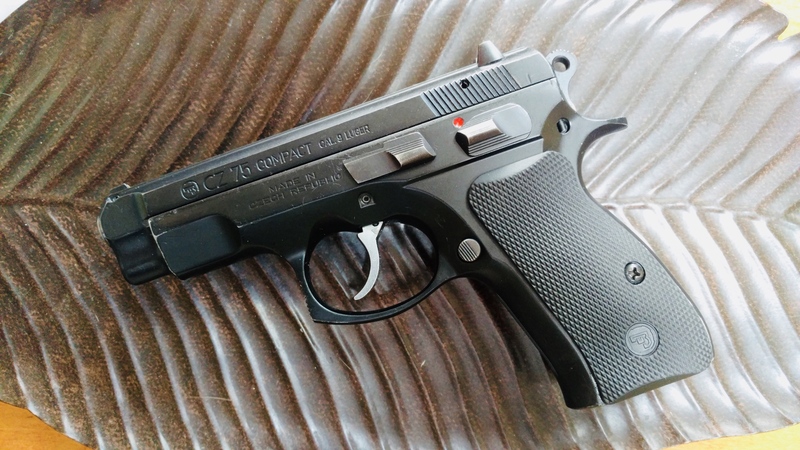 CZ makes alloy compact frames for the P-01 and PCR but those are both decocker guns. There are 3 variants that have a safety and an alloy frame, all fairly hard to find. The factory sold some P-02s and Compact Ls built that way to the US, and built some compacts like this one for a contract with Israel. Some of the Izzy guns got surplused out and sold to the US, including this one. It’s a PCR alloy frame, with a safety and a standard short rail 75 compact upper instead of a decocker and full rail slide the PCRs usually have. You don’t often see alloy framed safety equipped CZs (except the omegas now) so I was excited about it. I guess I would be excited about that too, nice find! Very nice, congrats, and nice family too. My P-09 is currently my favorite pistol. Anyone who says that isn't a "purist", they're a wannabe. The original caliber for the Commander was 9mm. Also, it was originally an aluminum frame, just like your Guardian. Later, when Colt came out with a steel framed version (still 9mm) the original aluminum framed pistol was renamed "Lightweight Commander". My Guardian is .45, as is my V-Bob. I like the 09s a lot. Surprising capacity for such a slim grip. I prefer shooting the metal framed guns but the P-09 carries very well.